polar is not recommended. Use polarplot instead. The polar function accepts polar coordinates, plots them in a Cartesian plane, and draws the polar grid on the plane. polar(theta,rho) creates a polar coordinate plot of the angle theta versus the radius rho. theta is the angle from the x-axis to the radius vector specified in radians; rho is the length of the radius vector specified in dataspace units. 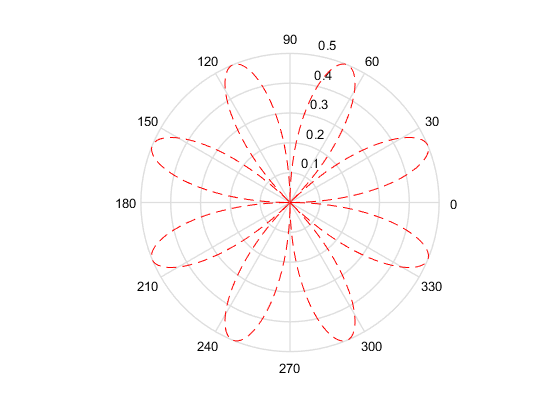 polar(theta,rho,LineSpec) LineSpec specifies the line type, plot symbol, and color for the lines drawn in the polar plot. polar(axes_handle,...) plots into the axes with the handle axes_handle instead of into the current axes (gca). h = polar(...) returns the line object in h.
Create a simple polar plot using a dashed red line. Negative r values reflect through the origin, rotating by pi (since (theta,r) transforms to (r*cos(theta), r*sin(theta))). If you want different behavior, you can manipulate r prior to plotting. For example, you can make r equal to max(0,r) or abs(r).